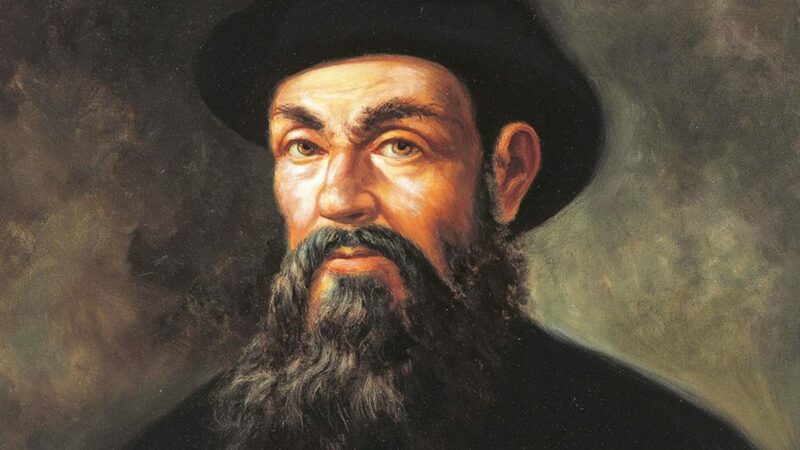 The name Ferdinand Magellan might ring a few bells for you. Even if you don’t know who he is, you will most likely recognize the name. In fact, he is one of the defining figures of history, and made one of the most important discoveries of all time when a voyage he led circumnavigated the globe! Those with a bit of knowledge of geography and history will know that Magellan was a Portuguese explorer in search of fame and fortune in the 1500s. This guy is a really important historical figure, so we should look more closely at his life and history. Welcome to the life of Ferdinand Magellan! Born in Sabrosa, Portugal, in 1480, Magellan’s family were reasonably well off, and with decent status. And, at the age of 22, he and his brother acted as pages for the Queen. During this time he heard tales of the rivalry between Spain and Portugal for exploration of the seas. This interest grew and developed into a passion, and Magellan vowed he would take to the seas. In 1505, he and his brother joined a Portuguese voyage to India and several more expeditions over the following seven years. He also engaged in plenty of battles, getting wounded, and picking up a distinctive limp he would carry with him the rest of his life. In the 15th Century, the great luxury commodity of the world was spices, and they were pivotal to the economy., Spice merchants became very wealthy, and lived lives of luxury, and this appealed to Ferdinand. Europe didn’t have the right climate for cultivating spices, so voyages had to be made to the countries that had them. Spain and Portugal led the expeditions to the Spice Islands, both trying to outdo the other at every turn. While some sailors had reached the Spice Islands, none of them had sailed around the globe, and Magellan wanted to be the first to do this. Ferdinand was a pretty experienced seafarer by this point and decided to set off from Portugal with a crew and bring back spices to claim his fortune. However, the King continued to reject his requests leading him to renounce his nationality and move to Spain for royal support. After befriending Diogo Barbosa, he got an audience with the King, who sanctioned the trip. In 1519, Magellan and crew boarded a ship and left Spain, and Europe behind. He would never see either again, but he was on the cusp of one of the all-time great discoveries. In 1519 the ship crossed the Atlantic, reaching South America in a month. Magellan was seeking a fabled strait that would allow them to pass through South America. Finally reaching it in October 1520, with a much-depleted crew, they began the treacherous journey through. After coming out the other side, they reached an ocean that Magellan named the Pacific Ocean. Eventually, the voyage wound up in Cebu, incredibly close to the Spice Islands, and it was here that Magellan died. The crew continued on the voyage, reached the Spice Islands, and collected a heavy cargo of spices. But, they also did something much more important – they circumnavigated the globe. Before this voyage it had been a common belief that the Earth was flat and small, but, the voyage Magellan had embarked on (but not lived to see) eventually proved it was round. 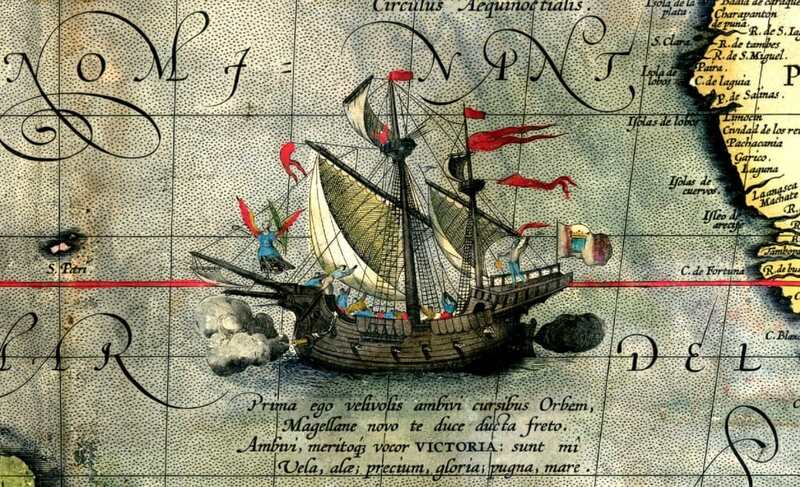 So Magellan was the first person to discover the Pacific Ocean, and to lead to the discovery of the Earth being round. He is often credited as being the first person to circumnavigate the globe. And, while this is true technically, it’s only true by surface area. Because he didn’t live through the last voyage, he isn’t the first person to fully circumnavigate from point A to A in one trip. This honor is bestowed upon Sebastian Elcano.